Humic substances are formed by the microbial degradation of dead plant matter. They are very resistant to further biodegradation. The precise properties and structure of a given sample depend on the water or soil source and the specific conditions of extraction. Humic substances enhance soil life and plant roots, chelate minerals (making them available for future use by the plant), and improve the absorption of minerals. Humus influences soil fertility through its effect on the water-holding capacity of the soil. The addition of Perma-Guard™ activated Diatomaceous Earth, with its high silica content, further enhances nutrient and moisture retention in the soil. Diatomaceous Earth improves the moisture retention in potting soil, sandy soils and garden soil not only by retaining water but also by slowing soil drying. Researchers at Southern Cross University recently found, "When compared to other sediment types, Diatomaceous Earth exhibits a high capacity to absorb and retain moisture...[and] contains a high percentage of silicon, which has the potential to increase plant growth." How Does Humic Acid & Activated Diatomaceous Earth Improve Soil? Superior quality activated Diatomaceous Earth augmented with humic substances improves the performance of all types of fertilizers which in turn stimulates vigorous root growth. Soil enhanced with HUMI-GROW™ Soil Conditioner shows increased bacterial activity. Plants become more efficient with all nutrients including water. Plants produce greater yields and have shown better stability under varying soil pH conditions. Continuous use of HUMI-GROW™ Soil Conditioner also results in increased resistance to wind and water erosion and reduced leaching of NPK from cultivated areas. How Does HUMI-GROW™ Improve Plant Growth? Plant growth is improved through the structural improvement of both clay and sandy soil allowing for better root growth development. Plant growth is also improved by the ability of the plant to uptake and receive more nutrients. Humic acid is especially beneficial in freeing up nutrients in the soil so that they are made available to the plant as needed. For instance if an aluminum molecule is bound with a phosphorus one, humic acid detaches them making the phosphorus available for the plant. Humic acid is also especially important because of its ability to chelate micronutrients increasing their bio-availability. Whether you are growing flowers or vegetables, high-quality soil is key to having a beautiful garden. Humic soil conditioner is vital for obtaining such fine soil. How does HUMI-GROW™ enhance potting soil? Adds organic matter to the soil to improve plant growth and performance. Improves oxygen levels in the soil for improved root growth. Improves soil drainage preventing root rot and improving root growth. Add 10 pounds of HUMI-GROW™ for every 100 pounds of potting soil. Mix with mulch, in flower beds and around trees at 2 lbs for every 40lbs of mulch. 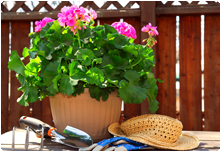 Potted Plants: 1 teaspoon for small containers, 1 tablespoon for large pots. See label for application guidelines.